Coach Chris offers One on One Personal Training in a Private Setting. Chris has been Personal Training with a variety of clientele since 1997. Coach Chris can help with a variety of goals from Weight loss, to injury rehab or just feeling stronger and having more energy. With Chris’ education and experience as a personal trainer and kinesiologist he can help you achieve all your health and fitness goals with a completely personalized program. "I have been training with Chris Helwig for 8 years. 8 years later I am fitter, healthier, more toned, stronger and have more lean muscle. Chris has helped me stay at a healthy weight and I have been impressed with how he can adjust my program when the odd injury has come up. Chris has a flexible schedule and I would highly recommend Chris to anyone that wants to lose weight, tone up and live a healthier life!!" "After a very serious knee injury, I needed a trainer who would help me recover lost strength, mobility and flexibility. Chris put together a personalized program and a year later, I’m stronger than I have ever been, my knee is doing better than my surgeon dreamed possible, and I plan to keep training with Chris for the indefinite future. He won’t scream at you, he won’t push you way past your limits… you’ll simply continually improve!! "After years of working out on my own, never seeing results, and giving up or hurting myself, I went looking for a professional. Chris sat down with me and asked me what my goals were and developed a training program that slowly built my strength and my confidence. This year, on my 45th birthday I’m running a Half Marathon, something I could never have imagined doing a year ago, but today it’s a realistic attainable reality. I’m stronger than I’ve ever been, I keep up with (and out pace) a very busy three-year-old, and I feel great about myself. Chris is tough, he’ll push you to do your best, knows your limits and will test them. " "I moved to London from Toronto to London in 2016 and joined Chris immediately for personal training. I had no specific goals in mind other than continuing to maintain a reasonably active lifestyle. While in Toronto I had several personal trainers and had found that seeing a personal trainer kept me focused and limited injuries due to improper exercise. I have continued with Chris since 2016 and the results have far exceeded my expectations in a number of ways. Specifically, Chris doesn't engage in the norm I found with trainers in Toronto; overly aggressive (and loud) "pushing" of physical limits, use of exotic equipment and techniques, and a myopic focus on "the workout" to the exclusion of other life factors that might by impinging on your fitness regime. Chris uses common-sense equipment and exercises that use my body's own resistance or uses simple equipment that is easy to understand in a unique way that keeps my workouts fun and safe. As mentioned, Chris' style is careful observation during the course of the workout so that I exercise safely and within my limits. The exercises he has me do change regularly so that various muscle groups are engaged and the variety keeps me engaged in the fitness process. The lack of use of exotic equipment means that if I am away from the gym for any reason, like personal or business travel, I am able to replicate our sessions on my own with very little gym equipment required. 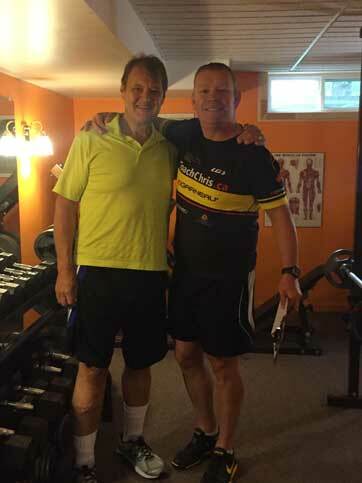 From my initial assessment and through continuing questions and re-assessments, Chris has taken a "whole-life" approach to my fitness regime. He is constantly asking me about events outside of the gym that may be impacting upon my fitness and is very careful to incorporate these concerns into my workout regime. I feel that I am being treated as a full human being rather than just a personal training customer. Chris is able to discuss at length my physical state, making recommendations for new exercises or lifestyle choices, as well as being able to address mental health issues that may be impacting my overall health. In sum, I have experienced a wide array of personal training staff and methodologies in a variety of places. Because of my experience with Chris, I have achieved my goal of putting "muscles in the right places" with speed and safety and no injury. If you are interested in results that fit your needs and your lifestyle, I would strongly recommend Chris for and form of training which you are interested."